The microphone and phone call speaker test allows you to test the microphone by recording a short audio sample and then test the ear speaker (phone call speaker) by playing this recording back. You should hold your phone as though you are having a phone conversation e.g. ear to the phone call speaker. Turning the volume up during playback will increase the “ring” call volume. The speaker test allows an audio track to be played through the media speaker(s). Turning the volume up during playback will increase the “media” call volume. 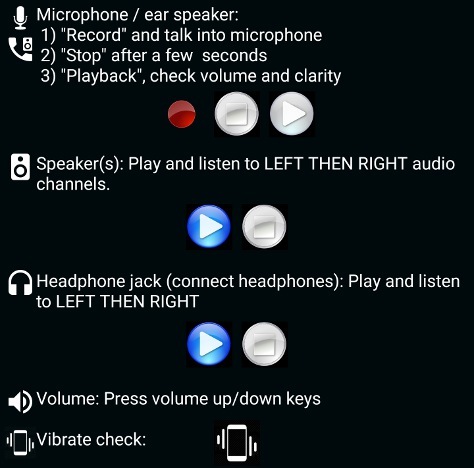 To test the headphone jack (or headphones) connect headphones and play the audio track. It is important to note that the media speaker and headphone jack tests are stereo tests and audio is played through the left channel for about 5 seconds, then through the right channel for about 5 seconds. If the device plays back mono audio (e.g. only one speaker on the device) then the audio track should be audible for the full 10 seconds. Some reasons for faulty microphones (e.g. the user on the other end of the phone call can’t hear you) are the microphone being wet, clogged with dirt or makeup, or obscured by the case or a hand. So visually inspect the microphone for this and carefully clean and/or dry the microphone. The in-call phone call volume is low. Try turning it up. The phone call speaker is partially obscured by the case (or partially clogged with dirt or makeup). Check the Phone call speaker is not obscured. There is a software problem. Try updating Android if an update is available. If not, you could just try switching the phone off and back on to reinitialize the audio subsystem software. If you are unable to hear anything through the media speaker(s), also check the above items. Try restarting the phone as this will reinitialize the audio subsystem. If none of this helps, it may be a hardware fault requiring repair. If the phone is still under warranty, consider taking your phone back to the place of purchase and talk to them.